Fernando Alonso summed it up after the Canadian Grand Prix: 'Today there is nothing to celebrate'. The race was a reasonably diverting one, containing plenty of worthy drives and deserved results. 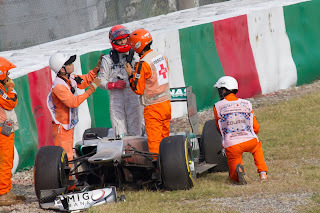 But in the hours after the event suddenly few were in the mood for conviviality, as news filtered through that a volunteer track marshal called Mark Robinson had been killed in an accident when returning Esteban Gutierrez's stricken Sauber to the pits after the race. It may sound like a cliché, but it's no less true for that, that anyone who cares about motor sport owes marshals an immeasurable debt of gratitude. No exaggeration this: no marshals, almost no motor sport. Motor sport cannot take place without them there, and while if no one volunteered to marshal the top-level categories such as F1 could probably find the cash to pay track marshals those categories lower down certainly could not. Marshalling is something I do myself on occasion, and every time I do it the skills and professionalism that marshals always exhibit astounds me, as does the extent that many of them give up their time - some almost every weekend - in order to volunteer (I don't count myself among this on either count - I only marshal for a handful of days a year). Seemingly the accident happened while performing the sort of task that any marshal does routinely, often several times in a weekend. As the Sauber was being returned to the pits by a pick-up vehicle Robinson, there to keep the car at a steady level and pointed straight ahead, stumbled while trying to pick up a dropped radio handset, and was then run over by the vehicle. He succumbed to his injuries later that day. Among the tributes to him I have also noticed the odd comment to the effect that 'lessons must be learned'. Perhaps it is inevitable, and is human nature, to feel an urge to do something after a shock such as this. But with all respect to such people and their expressed views, on the current evidence I cannot see how it applies perfectly here. As far as I can tell this was a tragic accident, no more, and while it was highly regrettable such an occurence can never be completely ruled out for as long as anyone works close to machinery. And for marshals safety is paramount. I know first hand that safety first of yourself and then of your fellow marshals is emphasised at each and every marshals' briefing at the start of every day on post, as well as in every training session that you do. However hard it is to accept, perhaps all we can do is leave things at that. To think that 2013 was supposed to be different. But this year's key F1 question is much the same as it was 12 months ago. Which was much the same as the year before too. 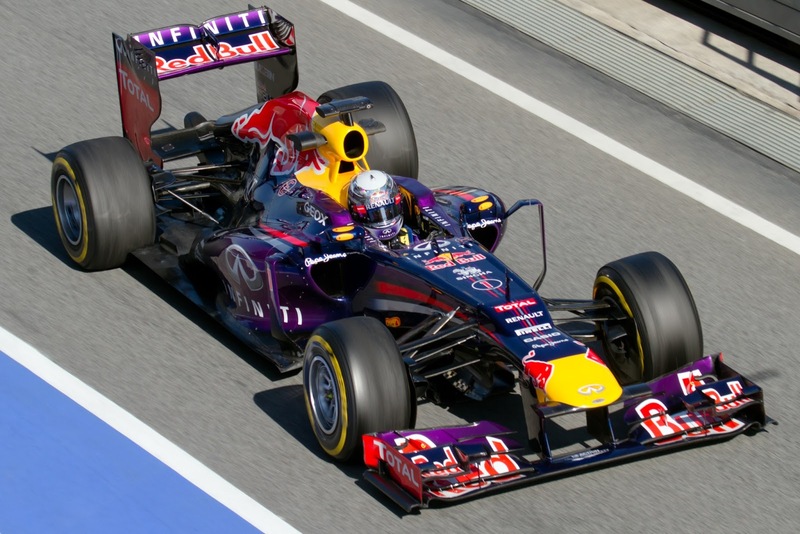 Just how can the Sebastian Vettel/Red Bull combination be usurped? 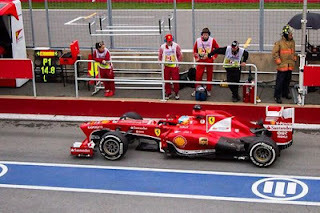 Even in a season wherein the Pirellis haven't always been to the team's taste, the Ferrari at least is thought to be a more formidable foe, and in which the squad's not had its strife to seek, it still leads both championships and comfortably. And while it remains early days, and form remains volatile, already it seems rather difficult to imagine how they can be denied title honours again. Seb's pace on occasion (such as on Sunday) has been devastating, but more importantly his results this season have been breathtakingly consistent. One day someone will tell the incredible tale properly of how the 'fizzy drinks company' (to use the pejorative) took over the remnants of Ford's abortive and in the main rather shambolic F1 effort, and within a few years had usurped the sport's most illustrious names at its very pinnacle. And then stayed there. And it's the second part that perhaps is the more impressive. Three double championships along neither Vettel nor his team are showing sign of even thinking about relenting, exhibiting the team and driver's 'never lift' motto. Quite where they are getting their motivation from is anyone's guess, but it's no less awe-inspiring for that. Jackie Stewart some time ago noted that ‘undoubtedly there is an infectious disease which afflicts every World Champion and team, and it’s been going on for years. It’s not right to say that the guy who’s champion loses his edge, or that the designer relaxes, the mechanics lose interest of whatever. But somewhere along the line these things occur – I’m talking about decimals points but they add up.' This was indeed the case for years, back-to-back championships in F1 used to be very rare. But just as with the Schumacher and Ferrari tie-up in the noughties, Vettel and Red Bull are very much discarding this orthodoxy. And one day too perhaps their achievements will get their proper recognition. Outwith the Red Bull team and its band of followers such sentiment is hard to come by right now. Part of this of course is that F1 winners in the modern age rarely get much affection, either from their vanquished or from anyone else. Part of this also is related to the team's habitual proximity to controversy, both as an accuser and an accusee. Snobbery over the team's and driver's 'arriviste' status doesn't help either. And when this day comes we'll probably bore our grandchildren about the good old days when we witnessed a great driver and team perform in unison at the top of their respective games. And perhaps, deep down, regret somewhat that we didn't appreciate it more at the time. From Montreal's podium ceremony it was clear that not all are enamoured with Sebastian Vettel. During this, particularly during his interview segment, booing of him from the assembled crowd was clearly audible. Whatever one's view of Sebastian Vettel (and I know they vary considerably) booing and other abuse of F1 drivers, particularly during podium festivities, is not something I care to hear. This is for a lot of reasons. For one thing such behaviour is boorish and belligerent; not what I like to be associated with F1. For another thing I feel generally that it is important to respect all sporting competitors, whatever our views or allegiances, and that it applies especially to the winner. And furthermore I love F1 for many reasons, and a major one among these is my view that at all F1 drivers, indeed many of those in F1 teams, are much better than the rest of us, capable of things I for one would never even consider let alone begin to put into practice. And for that reason they are worthy of a lot of respect. In particular the guy who has shown considerable dexterity in winning the race just ended. Such behaviour from F1 'fans' is not new of course, nor is it contained in Montreal. It's been a feature of the crowds at Monza for decades (including last year when the Italian Grand Prix victor Lewis Hamilton was subjected to vicious treatment) and I'm old enough to remember how Silverstone's massed ranks in the age of 'Mansell mania' used to fire dog's abuse at Ayrton Senna on an annual basis. And at least we can contend ourselves that such acts among F1 fans are much less common than among fans of many other sports (thinking about football in particular). But still I'd much rather that it didn't happen at all. 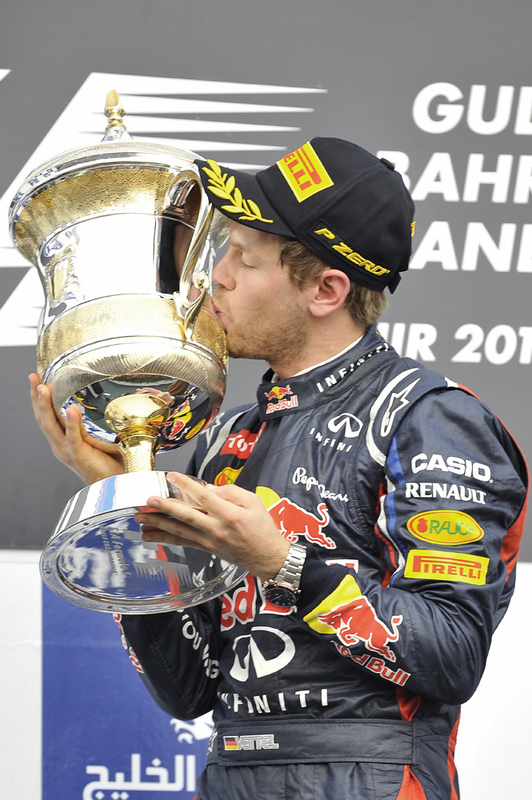 I've heard a few argue that the reaction Seb got was due to Malaysia and all that. That was no doubt part of it (though I find it hard to believe it was all of it as Seb-bashing existed long before this year's Malaysia race) and it's perfectly defensible to criticise Vettel for what he did there - indeed I condemned him in strong terms. But using the podium ceremony several races later to get your message across not only strikes me as the wrong time and place to do it, but also the wrong way. The podium is all about giving everyone an opportunity to pay tribute to the driver who has won on that day, and whatever else some may think of Vettel only those at the extreme and absurd end of the bloody-mindedness scale would suggest that he wasn't a deserving winner of the Canadian Grand Prix. And no F1 fan can argue there aren't enough opportunities to get your message across in other ways about Vettel or anyone else. It this day and age we're surrounded by them. And whatever the case, as your mother should have told you: two wrongs don't make a right. A further thing that bothers me about the behaviour of those booing Vettel was that there was no doubt plenty of fans there who indeed wanted to salute Vettel and to hear what he said in the interview, and those booing would have made it much more difficult, perhaps impossible, for them to do this. What right did those booing have to impose themselves over those who wanted to appreciate the podium for its primary purpose? Or did they just not care? Surely it's not a great deal to ask that they instead bit their tongues for five minutes. Or if they couldn't, to stay away from the podium altogether. Paul Di Resta - channelling his inner Nige? Don't wash your dirty linen in public. Keep everything in house. Win as a team; lose as a team. We're all aware of the maxims. 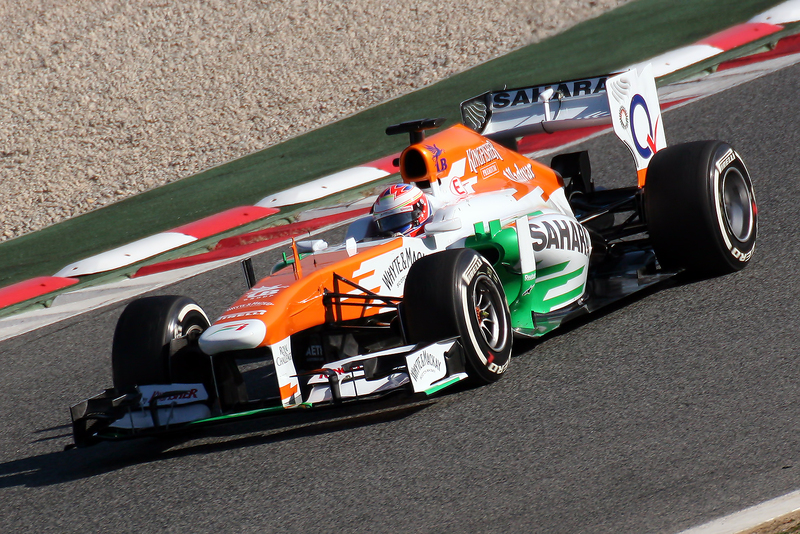 And it seems that for whatever reason Paul Di Resta isn't abiding by them currently. Barely a race weekend has gone by this season without him offering a public barb at his own team, and so it continued in Montreal after qualifying when Di Resta squarely blamed them for his dropping out in the first session, having apparently decided to keep his car in the pits to work on a non-crucial gearbox fault while the track was at its quickest in changeable conditions. On the face of it, such comments don't seem too clever, both in terms of the goodwill he gets from his own squad upon whom he relies as well as in advertising himself to potential employers from further up the grid (and there's little secret that Di Resta has ambitions in that direction). And it's not clear what inspires it: whether it is an emotional nature, or else an insecure one that feels it necessary to make sure everyone knows if he feels that a poor result of his wasn't his fault. But perhaps it's instead the case that he likes to raise the stakes, and gets motivation from giving himself nowhere to hide. In other words, once he's criticised the team in public he has little scope to not get the job done himself. With this one is put in mind of Nigel Mansell, another who was never likely to win awards for intra-team tact and geniality. Many who worked with Nigel most closely reckoned that this is where he got a lot of his motivation to perform: taking the view that the team was out to get him and never being shy to haul them over the coals. Whatever the case, Di Resta - just as was the case with Mansell for the most part - can be said in 2013 to be getting the job done where it really matters, including in Canada where he finished seventh after a rapid and perfectly-executed one-stopper. And presumably so long as Di Resta delivers on track as he is doing the team won't mind his lack of diplomacy too much. In F1, it's amazing the capacity good results have to make other problems go away. Finally, a seethe. Whoever invented DRS must, almost alone, be grateful for the Pirelli-related rancour that's been a nearly permanent presence this year, as it's meant attention has been taken away from the bête noire overtaking aid. But in Montreal, where the Pirelli tyres were less flimsy than usual, it didn't take long for some to mount their previous hobby-horse. This was especially so when footage started to do the rounds in the days after the race showing that when Alonso and Hamilton were engaged in their late fight for second, as they approached the circuit's DRS activation line almost side by side both feathered off the throttle in order to be second over the line and thus benefit from the resultant speed boost on the next two straights (personally, I thought it astounding that they had the presence of mind to think of it in that situation, but there you go). As you might expect there has been some hand-wringing at this, to the effect of 'this isn't what motor racing is about', 'get rid of the DRS' etc etc. I'd remind these people though that nothing - in F1 or in anything else - is without its downsides. Even very good things have drawbacks, just as very bad things are likely to have the odd redeeming feature, if you look hard enough (in the same way that the Black Death apparently solved overpopulation problems). And merely finding a downside isn't in itself necessarily justification to discard something in total. Instead such things must be viewed holistically. And if we're going to do that, imagine what the Canadian Grand Prix would have been like without DRS. My perception is that there would have been very little overtaking (even at this track which is relatively passing-friendly), particularly at the sharp end, and we'd likely have ended up with the likes of Fernando Alonso stuck behind slower cars for most of the way, in Nando's case perhaps finishing only third or fourth despite his pace. And we'd probably have had a round of complaints in response about how overtaking is way too difficult, that F1 is a laughing stock and the like. DRS isn't perfect of course - I indeed consider it a necessary evil rather than something to get enthusiastic about - but remember that nothing is. And at the risk of sounding like a stuck record, I'd much rather defend DRS than defend processional races. Great article, and due respect paid to the marshal who lost his life doing something he enjoyed, R.I.P Mark Robinson.